The Sunkist Sectionizer is not just for citrus. You can save valuable hours in the kitchen using our machine to uniformly slice, wedge or halve a variety of fruits and vegetables. Easy to use. Easy To Clean. Completely Safe. Unit comes with one blade cup of your choice. The Sunkist Fresh Fruit Sectionizer will make quick work of cutting fruit into uniform pieces. You can cut your citrus fruit into wedges, slices, or halves, and even wedge and core apples at the same time. 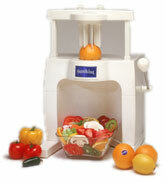 The Sunkist Sectionizer also does a beautiful job of slicing or wedging tomatoes. It is as simple to use as pulling a handle, and is much safer than cutting fruit with a knife. When you purchase a Sunkist Sectionizer you get your choice of one of seven different blade cups we offer. You can also purchase any of the other blade cups and plungers to use in the same machine, making it one of the most versatile sectionizers on the market. The blades are extra sharp to make them last longer, and as an additional safety precaution each one comes with a neoprene cup cover. It is very easy to remove the blade cups and plungers, and they can go in the dishwasher for safe and thorough cleaning. The Sunkist Sectionizer is made of sturdy ABS plastic and weighs only 13 pounds. It is listed by NSF International.